The What: WolfVision is extending its Cynap system portfolio with the new vSolution Cynap Pure wireless presentation system at ISE 2019. 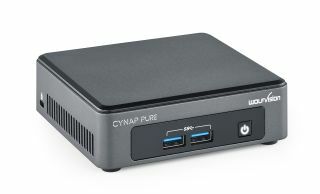 The What Else: Cynap Pure features comprehensive bring your own device (BYOD) screen-mirroring capability as its primary focus, providing wireless screen sharing for all iOS, Android, Windows, macOS, and Chrome OS devices onto a central shared display screen. Connection is quick and easy, and support for AirPlay, Chromecast, and Miracast mirroring protocols means that no software, apps, or dongles are needed when sharing content onscreen from smartphones, tablets or laptops. The Bottom Line: According to WolfVision, powerful processing capability is combined with enterprise-grade security encryption, flexible installation options, and remote management tools, to provide a compact, robust, and highly-configurable wireless presentation solution. Firmware updates are free of charge, and both customizable and prepared API modules are available. The new product can be seen in Stand 1-M20 at ISE 2019.